Renewing Night Conditioner is especially designed to support the skin’s natural healing process at night. It encourages cell renewal and provides powerful strength and elasticity to your skin. It balances moisture content and brings colour and vitality to pale skin. Night time is healing time for skin, when it has a chance to rebuild and rejuvenate and expel the day’s toxins. 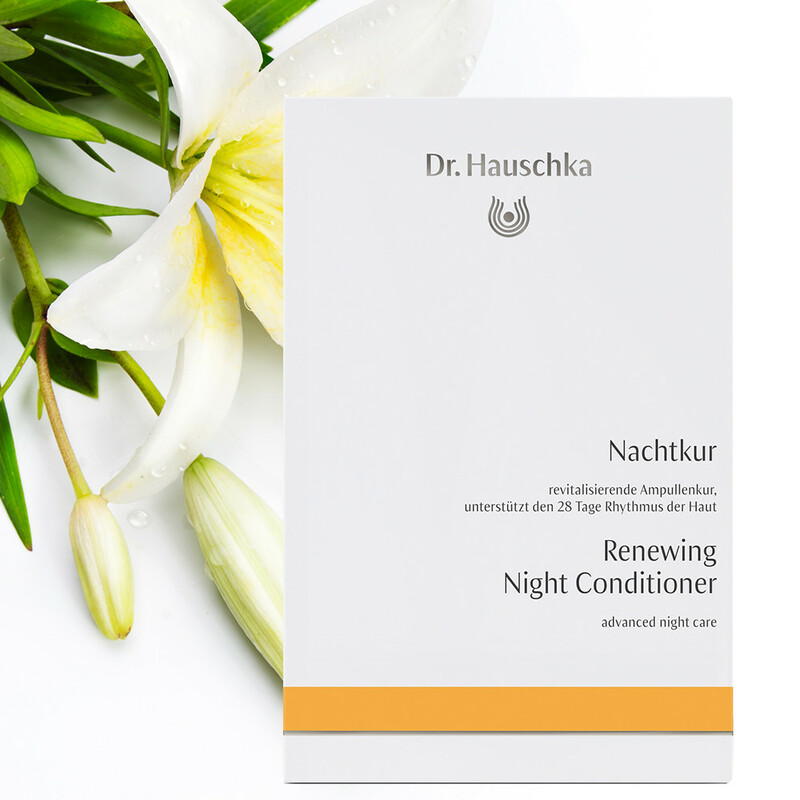 Dr Hauschka’s night products are specifically designed to help this process along; night creams can be quite heavy, as a rule, therefore preventing skin from its healing process, this light, oil-free conditioner allows skin to breathe and renew naturally. Renewing Night Conditioner caters for all skin types; dry skin is hydrated, sensitive skin is calmed, oily skin is balanced and rough skin is smoothed. Containing Rose Oil, which helps the epidermis to renew and regenerate, and Witch Hazel which cleanses and activates the pores, leaving the skin toned and healthy. Skin Type: Perfect for all skin types, including dry and sensitive. Application: In the evenings, use 1-2 ampoules to the face, neck and décolleté after cleansing. Press gently and evenly to skin until the solution has been absorbed. Use this product instead of a toner over a 28-day period as skin cells are renewed every 28-days. It is recommended to do one 28-day cycle of Renewing Night Conditioner per year for each decade of life. Tip: You will see astonishing changes in your skin if you chose to use this product consistently. Matching Products: Hydrating Cream Mask is the ideal complementary product. Its precious plant oils and waxes noticeably care for the skin, leaving it feeling super soft. Ingredients: Water (Aqua), Rosa Damascena Flower Oil, Fragrance (Parfum)*, Citronellol*, Geraniol*, Althaea Officinalis Leaf Extract1, Aloe Barbadensis Leaf Extract1, Kalanchoe Daigremontiana Leaf Extract1, Anthyllis Vulneraria Extract1, Helianthus Annuus (Sunflower) Extract1, Lilium Candidum Bulb Extract1, Rosa Damascena Flower Extract1, Hamamelis Virginiana (Witch Hazel) Leaf Extract1, Mica1, Royal Jelly1, Honey (Mel)1, Silver1, Sodium Chloride, Glycerin, Lactose.Water (Aqua), Rosa Damascena Flower Oil, Fragrance (Parfum)*, Citronellol*, Geraniol*, Althaea Officinalis Leaf Extract1, Aloe Barbadensis Leaf Extract1, Kalanchoe Daigremontiana Leaf Extract1, Anthyllis Vulneraria Extract1, Helianthus Annuus (Sunflower) Extract1, Lilium Candidum Bulb Extract1, Rosa Damascena Flower Extract1, Hamamelis Virginiana (Witch Hazel) Leaf Extract1, Mica1, Royal Jelly1, Honey (Mel)1, Silver1, Sodium Chloride, Glycerin, Lactose.Water (Aqua), Rosa Damascena Flower Oil, Fragrance (Parfum)*, Citronellol*, Geraniol*, Althaea Officinalis Leaf Extract1, Aloe Barbadensis Leaf Extract1, Kalanchoe Daigremontiana Leaf Extract1, Anthyllis Vulneraria Extract1, Helianthus Annuus (Sunflower) Extract1, Lilium Candidum Bulb Extract1, Rosa Damascena Flower Extract1, Hamamelis Virginiana (Witch Hazel) Leaf Extract1, Mica1, Royal Jelly1, Honey (Mel)1, Silver1, Sodium Chloride, Glycerin, Lactose.Water (Aqua), Rosa Damascena Flower Oil, Fragrance (Parfum)*, Citronellol*, Geraniol*, Althaea Officinalis Leaf Extract1, Aloe Barbadensis Leaf Extract1, Kalanchoe Daigremontiana Leaf Extract1, Anthyllis Vulneraria Extract1, Helianthus Annuus (Sunflower) Extract1, Lilium Candidum Bulb Extract1, Rosa Damascena Flower Extract1, Hamamelis Virginiana (Witch Hazel) Leaf Extract1, Mica1, Royal Jelly1, Honey (Mel)1, Silver1, Sodium Chloride, Glycerin, Lactose.